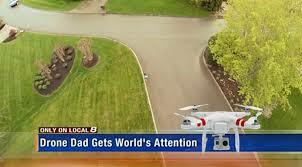 Was “Drone Dad” wrong to follow his little girl from the skies? (this post does not deal with Owntrepreneurship at all, just with being a parent nowadays…). Dubbed by Time magazine as World’s Most Embarrassing Dad (http://time.com/3831431/dad-daughter-drone-school/), this father followed his little girl to school from afar using a quad drone. But is it realty different than monitoring your child’s whereabouts using a smartphone app? or walking descretly after them to make sure they’ve arrived at school or friend place safely? I think that for the first time ever in our history the technology is catching up with parental paranoia and providing means for parents to monitor their child’s location and activities. and it makes sense, because the world we now live is has also changed. when I was a little boy I would run without adult supervision around our house (which was in a small, quaint street with almost no traffic), but now as I live a big city I will never allow my own kids to do the same. When I grew up we were gone for hours and only came home for dinner or when it was too dark to play outside. can you imagine your kid running off somewhere, with no cellphone where you can reach him at any time? sounds so irresponsible, but our parents never had any other option so they simply didn’t bother with monitoring our activities- which, for a parent in 2015 seem almost negligent. As a father of 2 girls I have no idea what I will do the day the insist on walking to school alone. Next Article Please help me select the new owntrepreneurship logo! You really need to proofread your writing and use a spell checker. As a father of 2 girls I have no idea what I will do the day the(y) insist on walking to school alone. Thanks for the feedback- I will definitely proofread it better the next time!